LiNbO3-type Mg2.98(2)Al1.99(2)Si3.02(2)O12 was synthesized by recovering a run product from 2000 K and 45 GPa to ambient conditions using a large volume press. Rietveld structural refinements were carried out using the one-dimensional synchrotron XRD pattern collected at ambient conditions. The unit-cell lattice parameters were determined to be a = 4.8194(3) Å, c = 12.6885(8) Å, V = 255.23(3) Å3 with Z = 6 (Hexagonal, R3c). 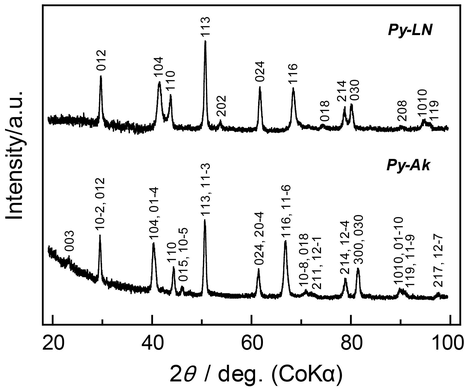 MF-XRD patterns of akimotoite (bottom) with the pyrope composition (py-Ak) synthesized at 27 GPa and 1170 K and LiNbO3-type phase (top) also with the pyrope composition (py-LN) obtained from recovering a sample from 2000 K and 45 GPa.